I have lots of stuff. I won't even attempt to hide that fact because it is impossible. In my eyes, my New York apartment doesn't appear to be overly cluttered, and the objects I have collected over the years are fairly well contained. But open a drawer and a bag of glass beads might pop out along with a 1980s matchbook from Macy's Midwest, when offering a light was a polite thing to do. Reach into the bedroom closet to retrieve a tote and a trio of vintage handbags might tumble to your toes. Peruse the jumble of books on a living room shelf and you might find a book you loaned me years ago. Not any more! I am in the process of sorting through the items I have loved and appreciated and passing them along to others who might feel the same way. And if they don't? No hard feelings, re-gift it to someone else or recycle it. One of the first Gifts of Thrift I sent out was to my nine-year-old-nephew, Grayson, who at a young age showed a passion for vintage shopping. 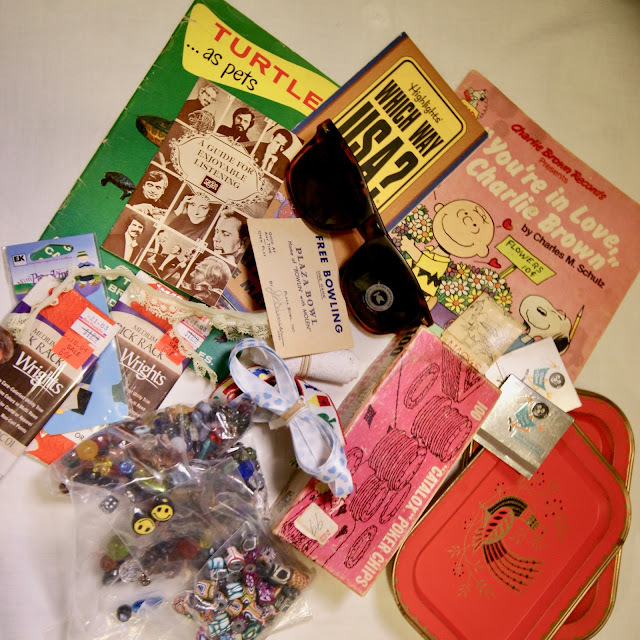 Among the items in his treasure box were objects that caught my eye on thrifting adventures or items I have saved for many years, such as "A Guide for Enjoyable Listening," a booklet that was a gift with purchase of violin strings in the mid-1980s from Shar Music. Other elements include match books from Strike 'N Spare, a bowling ally where my sister and I learned to bowl when we were in grade school. I found those at an estate sale in Independence, Mo., my home town. I found the four red rooster trays at a yard sale and the poker chips in the driveway of a garage sale, both while spending time at home. I gathered the relics from my past, added a handful of other finds and packaged them up with a note to my sister and Grayson telling them that I hoped they enjoy what I sent, but if not, then get rid of it. A few days later, I received a text from my sister: "Grayson loved the box. He said he is keeping EVERYTHING, but did give Tim (his father) the matches!!"